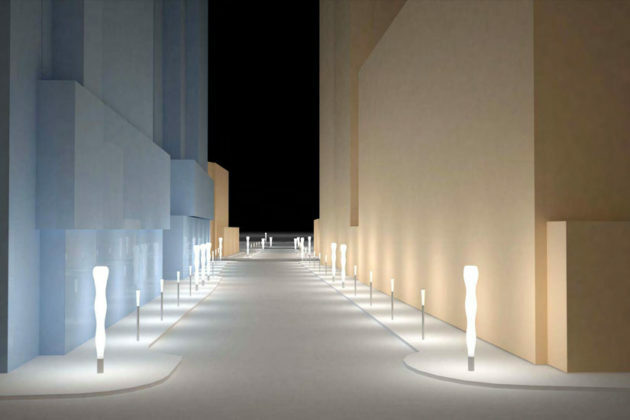 The “Corridor of Light” public art project that’s been discussed for six years is not expected to come to N. Lynn Street in Rosslyn for another three years, at the earliest. 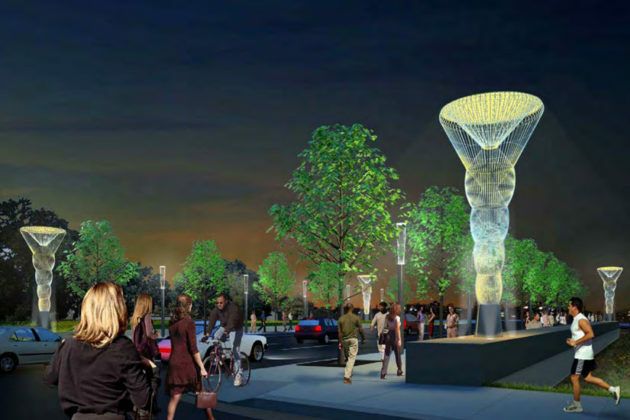 The art will consist of 68 sculptures, lanterns and light fixtures by Venice, Calif.-based artist Cliff Garten. 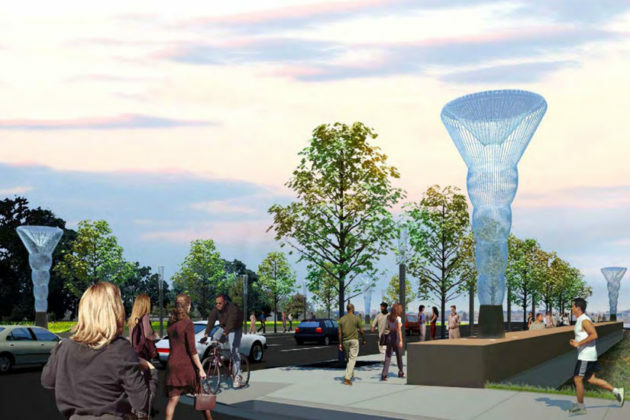 The pieces will be placed from the Lynn Street Esplanade over I-66, through the Central Place development, to the Meade Street bridge over Route 50. The project will be constructed in three phases. 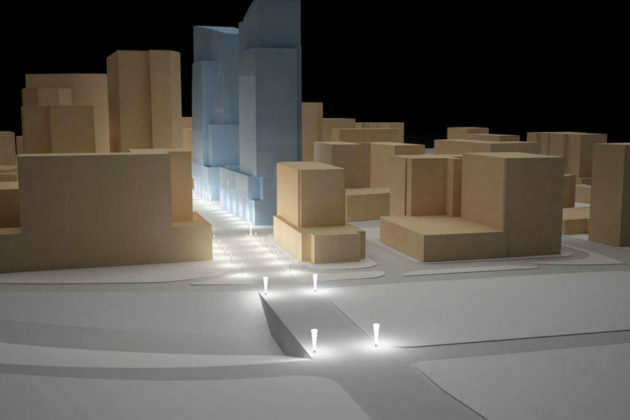 Phase I will be at the Lynn Street Esplanade — the two-part intersection with Lee Highway that doubles as a bridge over I-66 — with four, 20-foot tall “luminous bodies” on each corner of the intersection. This phase of the project is expected to be complete in 2017, in conjunction with planned safety improvements for the “Intersection of Doom,” at one corner of the Esplanade, Arlington Cultural Affairs spokesman Jim Byers said. 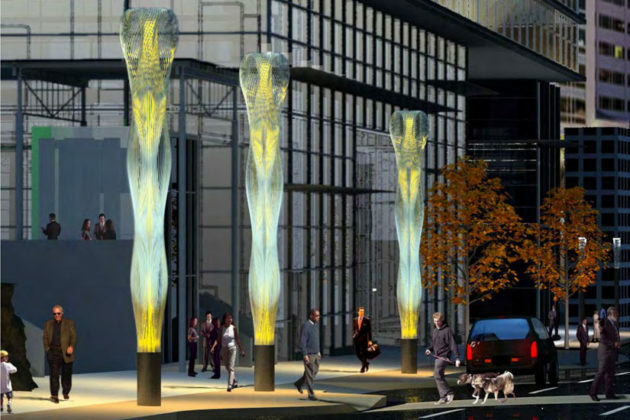 Phase II consists of four, 26-foot tall luminous bodies — different in form from the ones in Phase I — at the corners of the 19th Street N. intersection, plus four at the corners of the Wilson Blvd, and five mid-block on Lynn Street in the Central Place development. There will also be 16-foot lanterns all along the block and illuminated bike racks and benches. This phase of the project is expected to be completed in 2017 along with the Central Place office and residential towers. Phase III is largely the same in scope and look of Phase I, except on the Meade Street bridge. The $5 million renovation of the bridge, intended to make it more modern and pedestrian-friendly, is expected to be funded in 2019 as a joint project among the county, the National Park Service, which owns part of the land for the bridge, and the Virginia Department of Transportation. Phase III is expected to be complete and funded along with the construction. When complete, the project is intended to tie together Lynn Street in its complete run through Rosslyn. The luminous bodies — giant, stainless steel structures with environmentally friendly lights — will be able to be programmed for different colors, and change with the seasons. The project will be largely funded by JBG Companies’ contributions to the county’s public art fund, which were part of negotiations for extra density of the Central Place skyscrapers. Garten has already been paid design fees for Phase I and III, Byers said, but how much he has been paid was not made immediately available. Garten spoke to the Washington Post in 2008, when the project was already being planned, and said he estimated he would need $750,000 to $1 million to complete the project.